"How a can teenager make good money?" is a popular search engine topic for websites like Google.com and Yahoo.com. Having a job as a teen is a luxury, especially with the economy the way it is today. Many teenagers cannot afford to own their own car without having a job or a way to make money. Since insurance for teenagers often costs more than it does for an adult who has been driving longer, teens need jobs to pay the higher prices. They also need money to pay for gas, and any other activities that they might want to go do. If you are a teenager and are looking to make money to pay for a car, or some other large purchase, you do not always have to get a traditional job working in restaurants or retail. In fact, teens that can't drive probably wouldn't be able to get a job working outside of the home if they do not have reliable transportation. Getting a part time job at a local restaurant or retail store is always a sure way to make money as a teen, but getting a job somewhere like this might be hard, considering many jobs in local stores are being taken by adults more and more often. Babysitting is always a good way to make money as a teenager, and finding jobs as a babysitter is often easier than finding a job at a store. 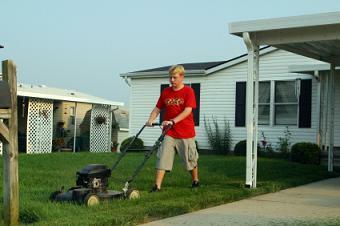 Mowing yards and doing landscaping is something that most adults do not like to do, and teens can usually find jobs around their neighborhood doing the landscaping of friends and family. Some teens are talented in areas such as writing or photography. These teens can make money by doing things such as writing freelance for newspapers or magazines, or selling their photos online. Teens who live in a rural area can earn money by helping out on farms, or they can try raising their own animals such as chickens, and selling them or their products. Looking for jobs can seem hard at first, but if you are resourceful, it should not be too hard to find a job or way to make money. Be on time. Whether you are going to an interview or to your actual job, it is important to not be late. Listen to instructions and follow all the rules that are set up by your employer. If you have to wear a uniform, be sure that you do so, and follow all dress codes. Having a job as a teenager looks good on college applications and is a good way to learn responsibility. While making money might seem hard to some teens, it really is as simple as finding something that you are good at and figuring out how you can make money doing it.